Will there come a time when people look back on the career of Robin Williams and wonder “was everyone who liked him on drugs?” Williams was championed as a great comic actor by the likes of Pauline Kael, but perhaps years of his schtick has turned it into a cliché. Or perhaps it’s living through the period where he eventually wore out his welcome as a comic performer, with films like Father’s Day, Hook and Jack ruining a lot of his goodwill. Fortunately he transitioned into a more serious actor, and films like Good Morning Vietnam and Dead Poets Society helped with that transition. Our reviews of both on Blu-ray follow after the jump. 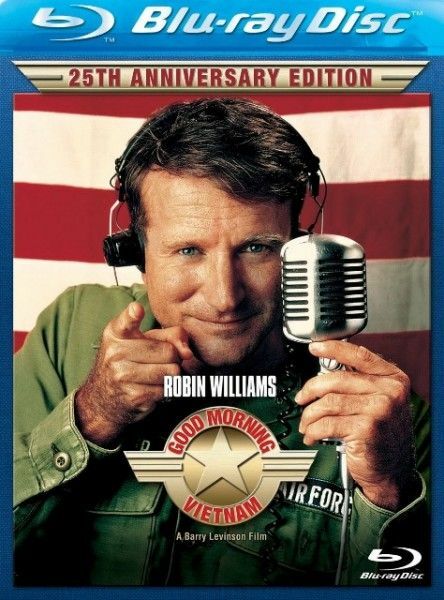 1987’s Good Morning Vietnam came as Vietnam had become fodder for the Oscars. And following Platoon and Full Metal Jacket, it was the sort of project that was tailor-made for Williams. He plays Adrian Cronauer, a disc jockey that becomes a cause-celeb with the troops for his “witty” on-air blather. He jokes about the higher-up’s and annoys Sgt. Major Dickerson (J.T. Walsh) and Lt. Steven Hauk (Bruno Kirby) with his caustic wit. But most of the people at the station love him – like fellow disc jockey Marty Lee Dreiwitz (Robert Wuhl) and assistant/would-be DJ Edward Garlick (Forest Whitaker). He also meets a woman that he sees going into a school, so he decides to teach her class English. But her brother may be a viet cong. Directed by Barry Levinson, the film is well put-together and highlights Williams’s gifts in a role that gives him a chance to also look sad when called on. He’s fine in the role, it’s just that Williams seems to have a limited repertoire, and it’s hurt because he goes to same imitations. Perhaps it was much funnier in 1987 to hear Williams do the voice of a stereotypical black man, or a flaming homosexual, but there days that stuff just grates. And then the film responds to his comedy by having people around him laugh uproariously, which was true at the time, but perhaps being more familiar with Williams makes it tiresome. Watching Vietnam now, is of like watching many older movies about serious issues that must have been seen as more daring or charming or more of the moment. Now it just feels mannered and quaint. It’s a softball, with a lead performance that was nominated for a best actor Oscar. No surprise. Disney’s Blu-ray presents the film in a 25th Anniversary edition in widescreen (1.85:1) and in DTS-HD 5.1 Master-audio. The film doesn’t look tremendous on Blu – the transfer relies too heavily on DNR so it can get glossy (not Predator bad, but still). The disc comes with all the old extras, including a six-part production diary (35 min.) which gets Levinson, Wuhl, Kirby, the real Cronauer, and others to talk about the making of the film. It’s followed by Raw Monologues (13 min. ), which shows Williams doing his improv in one take. The disc also comes with the film’s theatrical and teaser trailer. 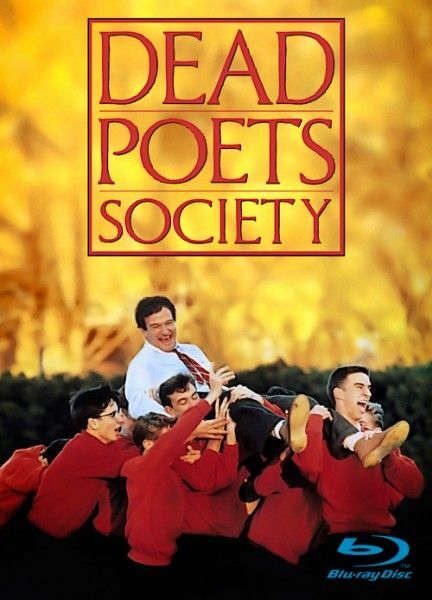 Much better in every way is Peter Weir’s Dead Poets Society. Here Williams “stars” but has a supporting part as John Keating, an influential professor over a group of young boys in prep school. Ethan Hawke is the new student Todd Anderson, who rooms with Neil Perry (Robert Sean Leonard), a “sensitive” boy whose father (Kurtwood Smith) bullies him into choosing certain classes and plans for his future. Keating encourages his students to look at the world in a different way, ignoring the stodgy attitudes of learned professors, and tries to get them to follow their passions. For Knox Overstreet (Josh Charles) that’s asking a girl out who’s got a jock boyfriend, for Neil it’s appearing the in the school play. 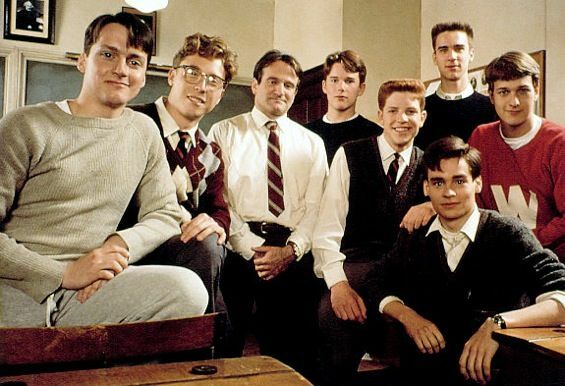 All the boys form a Dead Poets Society, where they meet in a cave and read poetry and bring girls. What separates a good director from a great director is the ability to make something that might seem a bit lame in description into something emotionally gripping and transcendent, and that’s Peter Weir’s gift in a nutshell. If you watch a film like this – or The Truman Show or Witness – you see a man with a fine sense of detail and a gift for making what could be clichéd stories engrossing. This could have been a shoddy knock off of literature like A Separate Peace, but instead it’s a film filled with wonder and the rush of adolescent excitement about the possibilities of the world. The film popularized the phrase “seize the day,” but even now it hits home. And all that is achieved through direction. From keeping the wonder in Williams puckish eyes without letting him do too many voices (and when he does they’re material appropriate) to getting great natural performances out of the group of young men he’s assembled, to Weir’s eye for nature, the film works. I was reticent to revisit the film in fear that it might not hold up, but the film captures something that is probably as meaningful to adolescents as it is to adults. Disney’s Blu-ray presents the film in widescreen (1.85:1) and in English 5.1 DTS-HD Master Audio. The picture quality is as good as the film can look, and the soundtrack is solid. The film comes with a commentary by Weir, cinematographer John Seale and writer John Schulman. It’s one of those edited together commentaries – and it’s hard to know if they were watching it when they recorded their comments, but it’s a thoughtful track, and worth a listen. “Dead Poets: A Look Back” (27 min.) gets Leonard, Melora Walters, Hawke, Weir, Kurtwood Smith, and many more to talk about the making of the film. Everyone remembers it fondly, and it’s an engrossing piece. “Raw Takes” (8 min.) shows deleted footage from the film, with more Williams – here going to one of their Dead Poets meetings. “Master of Sound: Alan Splet” (11 min.) has Weir and David Lynch talking about the film’s late sound designer. Both loved working with the man and their affection for the person and his talent shines through. There’s also a “Cinematography Master Class” (15 min.) where Seale walks through how to shoot an interior sequence. The film’s theatrical trailer is also included.